JERMAIN DEFOE HAD to keep his emotions in check before memorably marking his England return with the opening goal in the 2-0 win over Lithuania. Sunderland striker Defoe ended a lengthy international exile with his 20th goal for the Three Lions — four years on from his 19th — by slotting home Raheem Sterling’s cutback in the 21st minute of a routine World Cup qualifying victory. An extra poignancy was added to the 34-year-old’s day when he led England on to the field ahead of captain Joe Hart for kick-off, accompanied by terminally ill five-year-old and Sunderland fanatic Bradley Lowery. Defoe also walked out alongside the youngster for Sunderland’s home game against Chelsea this season and has visited him in hospital while receiving treatment for neuroblastoma. “It’s nice to score but just to win the game was important and we did that,” Defoe told ITV. It’s hard to put into words how I felt, I had to keep my emotions in check at the beginning – obviously little Brad’s with me. Jamie Vardy made the points safe midway through the second half having replaced Defoe with an hour played. The Leicester City striker and Manchester United youngster Marcus Rashford provided the lively cameos requested by boss Gareth Southgate as Lithuania flagged during the closing stages. “He [Southgate] just wanted me to break the lines and try and keep forcing them back so we could get the ball in the pockets and it managed to work for us,” Vardy told ITV. They’re going to come here and sit back. It’s up to us to break them down and we’ve done that twice. England are back in action as Group F leaders when they make the short trip to Scotland in June and, even though the likes of Harry Kane, Daniel Sturridge and Wayne Rooney are likely to be back in contention by then, Defoe has designs on sticking around. Obviously I’ve got to go back to my club and make sure I finish the season strong, like all the lads,” he added. 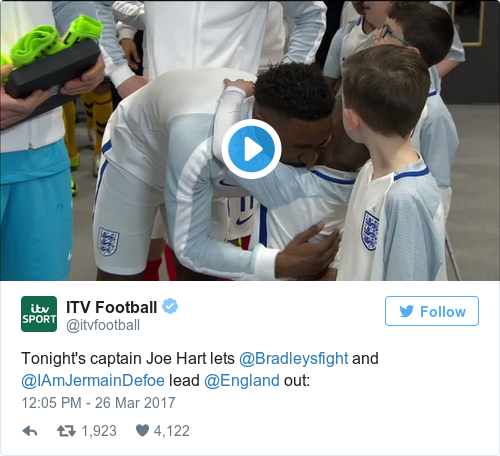 Email “Emotional Defoe back in the goals for England after leading team out with 'best mate' Lowery”. Feedback on “Emotional Defoe back in the goals for England after leading team out with 'best mate' Lowery”.